Here are the next set of questions in this series of World Quiz Championship Practice sets. PS Should have another competition next week, so still chances to win a Chambers Biographical Dictionary. 1. (Pictured) The Ryugyong Hotel stands at 330 metres high and contains 105 floors. It is thought that the plan for the building was a political response to the Westin Stamford Hotel in Singapore,built by the SsangYong Group. Described by some journalists as 'The Worst Building in The History of Mankind',in which Asian city is this striking building located,which is also the country's tallest building? 2.The highest peak on Crete it was sacred to the goddess Rhea in Greek mythology and is also the place where she concealed the baby Zeus from his father Cronus.It also has a namesake mountain in Anatolia,where Zeus was said to have abducted Ganymede to Olympus.What is the name of this mountain(s)? 3. 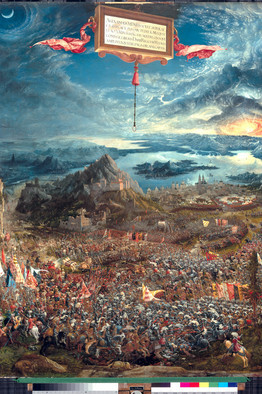 (Pictured) A part of the Danube school of German painters,which 15th/16th century artist created a series of eight historical battle scenes for William IV,Duke of Bavaria,including 'The Battle of Alexander The Great' (or Battle of Issus),which hangs at the Alte Pinakothek Museum in Munich? 1.A 19th century Swiss mountain guide and mountaineer,he is recorded as the first person to reach the peak of Mount Aconcagua and Tupungato.He also has a ridge on Mount Cook named in his honour.What is the name of this man,who shares his surname with one of the 1980's great downhill skiers? 2. (Pictured) A German-born physicist,he emigrated to the UK in 1933, following the Nazi Party coming into power. In 1954 he won the Nobel Prize for physics,for his fundamental research in Quantum Mechanics,and in particular his interpretation of the probability density function. What is the name of this scientist,who also had an illustrious list of assistants including Enrico Fermi, Werner Heisenberg,Wolfgang Pauli and Edward Teller? 3.It ran between 1843 and 1849,although 1844 is officially recognised as the year marking Independence Day. Led by Pedro Santana against several Generals,including Charles Riviere-Herard and Jean-Louis Pierrot,which country's War of Independence included the Battles of Azua (1844),Tortuguero (1844) and Beler (1845)? 1.She first came to prominence,playing the role of Bridget Hennessy in the US TV sitcom,'8 Simple Rules' and later appeared in the final series of 'Charmed'. She has also as appeared in a number of films and is married to the American tennis player,Ryan Sweeting. What is the name of this actress,who is best known today,for portraying the character 'Penny', in the US TV show,'Big Bang Theory'? 2. 'Persimfans' was a Moscow-based orchestra founded by Lev Tseitlin and existed between 1922 and 1932.During this time they gained worldwide acclaim and spawned imitators in Paris, Berlin, and New York, and in 1927,they were named an Honored Collective, by the Soviet government. The orchestra was remarkable as it was missing something that nearly all known orchestras had a the time.What was missing from the orchestra? 3.Born in Prague,he moved to the US in 1968,following the Warsaw Pact's invasion of Czechoslovakia.He formed his own group in 1976 and has since released many albums including frequent collaborations with Jeff Beck.Although he has a large catalogue of work,he is best known as the composer of the 'Miami Vice' (TV show) theme tune,which reached number one in the US in 1985,as well reaching the top 10 around the world.What is this composer's name? 1.What is the name of the former (East) German male athlete,that won the 400 metres Gold Medal at the 1987 World Athletics Championships in Rome,and in doing so,set a European record for that distance,which still stands today? 2.Playing their home games at the Imtech Arena,which is the only German football team to have played every season in the top tier of the German Bundesliga,since its inception in 1963? 3. (Pictured) Serena Williams has only ever lost in the first round of a Grand Slam singles event on one occasion. Which French tennis player,who reached career high ranking of 16 in 2009, inflicted this defeat at the 2012 French Open? 1.In 1995,Colombia opened its first metro rail system made up of two lines and 21 stations. In which city,the country's second largest by population is it located? 2. (Pictured) Once a a major stop on Route 66,which city, associated today,(sadly),for a terrible 1995 event took over from Guthrie,as a US state capital in 1910,three years after the state was admitted to the union? 3.They are a chain of islands and atolls in French Polynesia and form the largest chain of atolls in the world, spanning an area of the Pacific Ocean roughly the size of Western Europe. Islands on the atoll were first visited by Ferdinand Magellan,but were brought to worldwide attention in the 20th century,when France used the area for its nuclear testing programme.It is also the place where Thor Heyerdahl's voyage on Kon-Tiki ended.With a population of around 18,000,what is the collective name for these islands? 1.The World's two most expensive buildings are both from the leisure sector. The first is located in a famous area of the city associated with sport and the second is called 'Resorts World Sentosa'. In which Asian country are these two buildings located? 2. (Pictured) In February 2014,due to a catastrophic administrative error by the city's Employment Service,61,000 jobseekers,instead of 1,000, were sent invitations to a small (10 employer) job fair,known as the Gumtree Recruitment Fair. 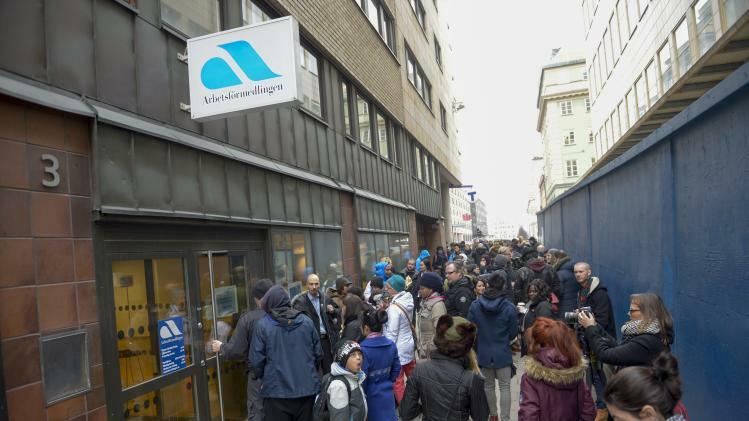 This sparked chaos in the city and soon needed a substantial police presence.Reported globally,in which Scandinavian city did this mistake occur? 2.Annie Edson Taylor,a former music and dance teacher from Michigan,seeked a way of financing her later years to avoid the poorhouses. In 1901,on her 63rd birthday,she became the first person to accomplish which achievement and survive,(as all before her had died trying)? - her cat actually survived the same feat only two days earlier? 1.Starring Faye Dunaway, the (now cult) 1981 film 'Mommie Dearest',was a biographical film,describing a mother and daughter's turbulent relationship,and based on a 1978 book of the same name. Written by the daughter,Christina,which Hollywood actress,who died in 1977,was being described as 'Mommie'? 2. Inspired by a suggestion from Andrew Carnegie,which American author's most famous work, 'Think and Grow Rich' (1937), is one of the best-selling books of all time? 3. (Pictured) The characters were first seen in the 1960s animated tv series,The Rocky and Bullwinkle Show. In 2014,they were made into a DreamWorks feature film starring Ty Burrell and Max Charles in the titular roles. The story follows 'the world's smartest dog' adopting an orphaned infant,who go on to have a series of time-travelling adventures. What is the name of this film,which had grossed over $250million worldwide by the end of April 2014? 1.Located in Australia and Asia,(particularly India),it is named after the habitat in which it is most frequently found.During the World War II Battle of Ramree Island,it is thought hundreds of Japanese soldiers were killed by these animals,after encroaching into their territory. What is the name of the this crocodile,the world's largest reptile? 2.Listing five methods of inductive reasoning,which 19th century British philosopher wrote the 1843 book 'A System of Logic',with the intention to highlight the issues of causation? 3. (Pictured) Consolida is a genus of about forty species of annual flowering plants in the family Ranunculaceae, native to western Europe, the Mediterranean and Asia.All parts of the flower are poisonous,including the seeds and are particularly harmful when young. A large amount of cattle deaths in Western US states have also been attributed to this plant. What is the common name for this plant,which is also used to describe the many species of Delphinium?